1. Where did the idea for Inspire come from? I was actually camping with my family when the idea for the story came to me. We had just hiked through the woods down to a lake, and I was staring out at the boats when it hit me. I spent the rest of the afternoon “daydreaming” away. 2. How did you come up with the name of the title? 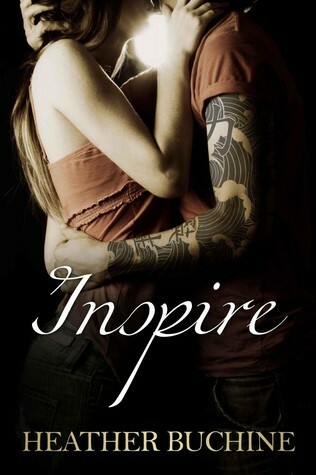 My protagonist, Paige, has a tattoo that inspired the title “Inspire.” It’s also a key part of her character. 3. What was the hardest part of writing Inspire? The easiest? The hardest part of writing the book was writing the ending. It took a couple of drafts before I was happy with the way I was leaving off. (I’m trying not to give too much away, so I’ll leave it at that.) The easiest part was writing the dialogue between Paige and Travis, and the “LOVE” scenes. They were fun to write!! 4. Are you working on any other projects? Yes. At least two of the other characters from this book are getting their own stories, and then there are a couple other projects in the works. 5. Do you have a specific writing process? I really consider myself a mix between a panster and a plotter. The first part of my process is visualizing the characters and the main scenes of the book. My mind starts playing them out like a movie, and so I write it down exactly how I see it. Then, I go back and fill in the story around those scenes until I have a book that I would like to jump into. Although I outline my book ahead of time, things always change along the way as I get to know my characters better. 6. Do you have a certain time of day where you feel most creative? Honestly, not really. I usually always have a notebook nearby so that I can scribble down things as they come to me. I could be in the shower, in the car, running through the check-out line, or making dinner and something may hit me. 7. Do you have any favorite authors? Yes, I have LOTS of favorite authors, but the two that stick out the most are: S.C. Stephens and Abbi Glines. Their stories come to life for me, and I have a thing for their leading men! 8. What tips or advice do you have for other aspiring writers? By no surprise my favorite hobbies are reading and writing. But beyond escaping into the written fantasy world, I love experiencing new things. Surfing, motorcycle riding, snow blading, glass blowing, parasailing, SUP boarding are just a few that I have checked off my bucket list, but there is still so much more to explore. Right now, being a mom is my biggest adventure and the best by far!! In the quiet calm hours of the night though, I can usually be found typing away creating a world of romance where drama still exists but love (hopefully!!) always prevails. Book Blitz courtesy of Xpresso Book Tours.